During the Photokina currently happening in Germany, Fujifilm announced that it will be releasing a next generation format "instax SQUARE format film” and “instax SQUARE camera", which is all set to rock the photography world. The camera has a 1:1 aspect ratio making it comfortable for shooting portraits and landscapes. The square format is the current trend amongst smart phone users. According to Instax website, "It's because we live in our own particular ways, that a single unassuming slice of "normal" can become a photographic work of art. The joy of capturing a familiar scene or the candid expression of someone special, and making it your own. The film slowly emerges and you hold it up, peering at it impatiently wondering "Is it ready yet?" Transforming the everyday into a work of art. instax SQUARE. A photograph reflects the one who took it. The world spread out before you and the emotions that rise differ from moment to moment. A camera that lets you intuitively capture the subtleties of the heart and passing moments in a square world, preserving it in physical form: instax SQUARE. A brand new device that stimulates your creativity and arouses your curiosity is born. Stay tuned for more details about their square format instax camera. Fujifilm is also planning to release a mirrorless medium format digital camera, which is a first of it's kind for Fujifilm and it's certainly a huge announcement. The GFX 50S, is the first camera in all new GFX line, and it is a 51.4 megapixel medium format mirrorless camera. Fujifilm's X-processor Pro is well known for it's ability in reproducing color and tone, so images shot through this camera will be of great appeal to photography enthusiasts. The GFX 50S comes with a new Fujifilm G format sensor, which measures 43.8×32.9mm and has 51.4MP in resolution. It comes with aspect ratios. 4:3 which is the default and you can choose 3:2, 1:1, 4:5, 6:7, and 6:17. 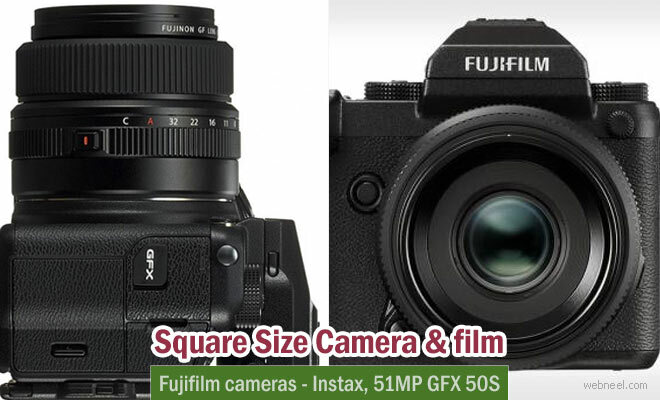 While comparing to the traditional camera, the GFX is a compact and light weight camera, making it easier for travel photography. Even though it doesn't come with an in-built view finder, you can use a detachable viewfinder, which makes it easier to shoot with an external monitor, thus making it even more lighter and highly portable. You also have a vertical battery grip, making it easy to shoot portraits. Initially six lenses will be released 63mm f/2.8 (50mm equiv in 35mm terms), 32-64mm f/4 (25-51mm equiv), 120mm f/4 (95mm equiv), 110mm f/2 (87mm equiv), 23mm f/4 (18mm equiv), and 45mm f/2.8 (35mm equiv). The camera will be released in 2017 and more details about pricing and exact date will be released by Fujifilm later on.